Outer ear infection, also called otitis externa or swimmer's ear, is an infection of your ear canal. Your ear canal (or auditory canal) is the tube that connects you outer ear to your eardrum. Symptoms can include, pain, itching or discharge from your ear canal. You might also temporarily lose some hearing. Bacterial or fungal skin infections can cause outer ear infections. You are also more likely to get infections if you have skin condition such as eczema or psoriasis in your ear canal. Outer ear infection is also common in swimmers because bacteria like to grow in moist environments such as water in your ear canals. We treat outer ear infections with ear drops and symptoms usually improve within a few days. We use antibiotic, antifungal or steroid drops depending what's caused the infection. This leaflet explains how to use ear drops. You can also take paracetamol for pain relief if you need it. It's best to avoid getting water in your ears for seven to 10 days after you've had an outer ear infection. If you have a lot of pus or debris in your ear canal, it may need to be gently sucked out. Your practice nurse can often do this, or you may need to go to an ear hygiene clinic. Phone your general practice and ask who you should see. If your symptoms are very bad or don't get better within a few days of starting treatment, see your doctor. You should also see your doctor if you have an ear infection and also have diabetes or other long-term health problems. Don't poke anything into your ear canal as this can injure your ear canal and make infection more likely. It can also push debris further into the ear. Keep your ears dry when swimming – use a tightly fitting swimming cap. Use ear drops (ask your pharmacist or GP which to use) after swimming if you keep getting outer ear infections. 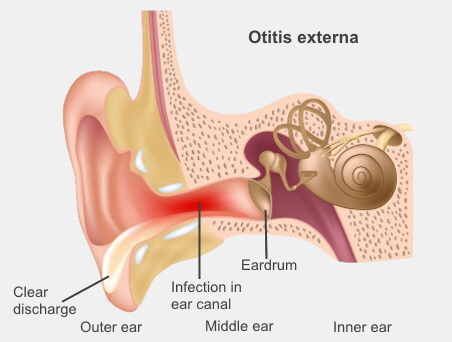 More information on otitis externa, including skin conditions that may cause it. What causes otitis externa, how it is treated, and when to see your GP. Written by HealthInfo clinical advisers. Page created December 2015.